Burris only played 185 snaps last year. In that small sample size, he graded poorly, achieving a PFF overall grade of 47.8 and a coverage grade of 47.7. 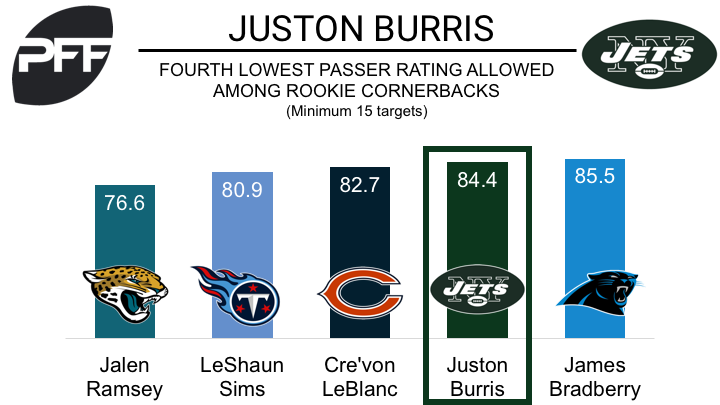 Despite his poor grade, Burris allowed a passer rating of just 84.4 on throws into his primary coverage, the fourth best mark among rookie cornerbacks with at least 15 targets. The Jets are reportedly looking at playing Burris in the slot and Skrine outside in nickel packages, but Skrine’s numbers in the slot last year were good, allowing 0.83 yards per cover snap, the fourth best total among the league’s cornerbacks with at least 270 coverage snaps.